"Making your own chocolate croissants takes a while, but for these crispy-on-the-outside, tender-on-the-inside pastries, it's time well spent. This recipe was adapted from one by Bruno Albouze, from The Real Deal (which he is). This is actually the quick version in that we're not leaving the dough to rest overnight before laminating with the butter." Place warm water in the bowl of a stand mixer. Sprinkle with yeast. Let yeast dissolve for 10 minutes. Add sugar and bread flour. Sprinkle with salt; add 3 tablespoons butter. Attach the bowl to the stand mixer. Mix dough with the dough hook just until butter is completely kneaded in and the dough forms a ball and pulls away cleanly from the sides of the bowl, 3 or 4 minutes. Transfer dough to a work surface and form into a semi-smooth ball. Place dough back in the mixer bowl; cover. Let rise in a warm spot until doubled, about 2 hours. Transfer dough to a lightly floured work surface. Push and press dough to deflate it, and form it into a rectangle. Fold into thirds by lifting one end over the middle third, and folding the other side onto the middle. Wrap in plastic wrap. Place on a rimmed baking sheet lined with a silicone mat. Refrigerate until chilled through, about 1 hour. Cut 1 stick of butter in 1/2 lengthwise and place halves slightly apart from each other on a length of parchment paper long enough to fold over the butter. Fold the parchment paper over the butter. Press butter down. Roll out with a rolling pin to a square about 8x8 inches. Refrigerate until a little chilled and just barely flexible, 10 or 15 minutes. Roll dough out into a rectangle slightly wider than the butter slab and just over twice as long. Place butter on one half of the dough leaving about 1 inch margin from the edge of the dough. Fold the other half of the dough over the butter. Dust work surface and dough with flour as needed. Press rolling pin down on dough to create ridges. Then roll out the ridges. Repeat this process. Keep pressing and rolling until dough is about the same size rectangle as you had before you folded it in half, dusting with just a bit of flour as necessary. Starting from the short side, fold one-third of dough over middle third. Then fold the other end over to form a small rectangle. Flatten out just slightly with rolling pin. Transfer to the silicone-lined baking sheet; cover with plastic wrap. Refrigerate until chilled, about 30 minutes. Transfer dough back to work surface and repeat pressing and rolling technique until dough is the size of the previous larger rectangle. Fold into thirds again, starting from the short side. Press and roll slightly. Transfer back to lined baking sheet. Cover and refrigerate about 15 minutes. Roll back out to a large rectangle. This time, fold dough in half. Then press and roll out into a 1/2-inch thick rectangle, using as little flour as needed to keep dough from sticking. Dust dough with flour and roll out to a rectangle about 1/8-inch thick. Cut dough lengthwise into 6 pieces using a pastry wheel. Pull and stretch out 1 of the dough pieces until ends are slightly tapered. Line 1 to 2 tablespoon of chocolate 1 inch parallel to the bottom edge and an equal amount of chocolate 1 more inch ahead. 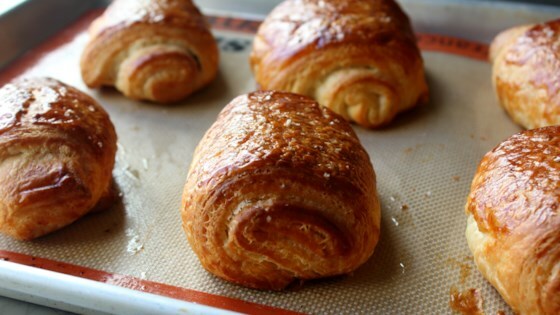 Roll dough up over the chocolate toward the top short edge to form a croissant with the seam at the bottom. Repeat with the remaining 5 dough pieces. Place shaped croissants on baking sheets lined with silicone mats. Whisk together egg and 1 tablespoon water to make the egg wash. Brush croissants with a large portion of the egg wash. Place in a warm area to allow them to rise, 60 to 90 minutes. Preheat oven to 400 degrees F (200 degrees C). Brush croissants gently but thoroughly again with egg wash. Sprinkle sea salt on top. Bake in preheated oven until beautifully browned, about 25 minutes. Transfer to a cooling rack. Cool to room temperature, about 1 hour. See how to make chocolate croissants. The technique is pretty straightforward, but be sure to pay attention to the temperature of your butter. If your slab is too soft, it will just blend into the dough and you won't get the gorgeous layering. And if it's too cold and firm, it won't spread between the layers of dough like it needs to. It should basically have the firmness of clay. So, take your time, and when in doubt, pop the dough in the fridge for a few minutes to chill it down as you're working. If you're substituting table salt for the coarse kosher salt, use just 1 3/4 teaspoons. Feel free to seal the croissants with egg wash at the end of Step 11 if you like.